Welcome once again to 'The Teddington Cheese Wire'. In this issue we will be featuring the fabulous goats' milk cheese, 'Chabichou de Poitou' from the Loire in France and using it in our recipe 'Tian Provençal'. We will also turn our attention to British cheese and ask what the future holds. Above from left to right: Sannen, Anglo-Nubian and Toggenburg breeds of goat. A popular idea over the past two months has been the 'Cheese of the Week'. Almost every day customers tell us about their favourite cheeses or those they have tried whilst away on holiday. It was frustrating for us to imagine these cheeses and not be able to taste them and equally frustrating for customers when told that we could not add them to our range. It is not possible to keep more than a hundred or so different cheeses in tip-top condition at any one time and, with several thousand cheeses available, we can only stock a fraction of these. The 'Cheese of the Week' has allowed us to try a different new cheese each week. We can read about and look at pictures of cheese but it is not until we actually see, feel, smell and then taste a cheese that we get to understand and remember it. Opening the cheese of the week for the first time is always an exciting occasion for the cheesemongers at The Teddington Cheese. We each give our opinion and wonder if it will win over the hearts and taste-buds of our customers. One of the greatest pleasures is then presenting the cheese and hearing our customers comments. Of course, bringing back the pleasant memories of a customers holiday or the happiness of a favourite cheese, even if only for a week, make it extra special. Can you eat the cheese rinds? What does the future hold for traditional British cheese? La Pierre Belle - soft unpasteurised goats' milk cheese from France; Berkswell - firm unpasteurised ewes' milk cheese from Warwickshire; Mahon - semi-soft pasteurised cows' milk cheese from Mallorca, Spain; Glenogra - semi-soft un-pasteurised cows' milk cheese from Ireland; Dunsyre Blue - firm unpasteurised cows' milk blue from Lanarkshire, Scotland; Hereford Hop - firm pasteurised cows' milk cheese coated in hops; Tomme d'Abondance - unpasteurised cows' milk cheese from the Haute-Savoie; Manchego - award winning unpasteurised ewes' milk cheese from Spain. "I'd like a clove of cheese, a long hundred of eggs and a bag of biscuits"
"I'd like 8lbs of cheese, 10 dozen eggs and 102lbs of biscuits"
"I'd like 3.6288kg of cheese, 120 eggs and 46.2672kg of biscuits"
Although we have to buy, label and weigh our cheese by the kilogram you can rest assured that we will always understand you. (Measurements taken from the 'Sunlight Year Book' guide to weights and measures 1899. When they first moved into Greenacres Farm in the mid 80's, Kevin and Alison relied on the production of free range eggs from their flock of hens in order to make a living. Nowadays, although better known for their delicious goats cheese, the Blunts still sell their fresh free range eggs. Unlike commercially produced eggs, these do not have to conform to a unified shade of shell and yolk and each egg is a real treat. Several months after the release of this edition of the Cheese Wire Kevin and Alison Blunt sold off their flocks of hens in order to use their land to accomodate more goats. We will let you know when we have found a new supplier of truly free-range eggs. The winner of the caption competition in issue 5 was Mrs Cheshire of Rednal, Birmingham with: 'I always hand wash my delicate things'. Thank you to everyone who entered our competition. We had so many excellent entries and they have kept us chortling for hours. We're sorry that we can only afford one prize. The 'Saracens' were a people of Arab descent, who originally settled in the south of Spain but then gradually moved north into France. By the 8th century they had reached Poitiers in the Loire valley, but it was at this point that they were finally repelled. When they were expelled from France, they left behind not only goats, but also recipes for making cheese from their milk. The Loire valley became the starting point in the history of goats' milk cheese in France, and remains the most important area of production. Villages on either side of the Loire river produce goats' milk cheeses of different sizes and shapes. These cheeses have delicately varied flavours and include five AOC's - a classification given to cheeses in the same way as wines. In the eastern part of the area there is the small drum-shaped Crottin de Chavignol; to the west the log-shaped Saint Maure de Tourraine; to the north of the central region the round-shaped Selles-sur-Cher; to the south the pyramid-shaped Valençay and to the south-west the cone-shaped Chabichou de Poitou. Poitou is the most important goat breading region in France. The Chabichou du Poitou takes its name from the local dialect word for 'goat' derived from the Arabic 'chebli'. The cheese is emphatically goaty in flavour and aroma. The paste is firm and white and the rind is pale blue-grey in colour. There are many industrial versions of this cheese but ours is made using traditional farmhouse methods. Each cheese is approximately 6cm high, is cone-shaped with a 4cm base and a 3cm top, weighs 100 to 150grammes and has a minimum fat content of 45%. Cheeses are available throughout the year and the best are made from spring to autumn. 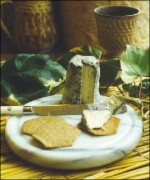 Chabichou can be eaten fresh or matured for four weeks in a cool and humid cellar, during which time the blue-grey rind develops. 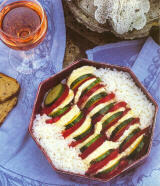 Chabichou can be accompanied with Sancerre, Pouilly Fumé or the red wines of the Loire. The cheese is excellent both on the cheese-board and for cooking; it is fabulous when sliced and grilled. At the moment we are undertaking extensive renovation work on an old property on Sandycombe Road in Kew. We are planning to open this second shop in July with the same fine cheeses and produce that we sell at the Teddington Cheese. We will also be extending our wine range and introducing a selection of cheese and wine accessories. We are often asked whether the rinds of cheese can be eaten. The answer depends upon where and for how long the cheese has been matured and also how the cheese is made. Stilton, Double Gloucester, Gruyere: These cheeses are matured for many months with their rinds open to the air. Dust in the cheese store easily falls onto the cheeses. We do not recomend eating the rinds of these types of cheese. Brie, Camembert, Chanteraine: Younger bloomy rind cheeses sit in the open, maturing for shorter periods and in a clean environment. This type of rind can be eaten. Farm-house Cheddar, Cheshire, Lancashire: Although these cheeses are matured for many months and even years, they are protected by a covering of cheese cloth. This cloth is stripped off just before cutting for sale and the clean rind can be eaten. In days gone by babies would have been given these hard cheese rinds upon which to 'teeth'. Epoisses, Munster, Langres: Washed rind cheeses tend to be pungent in aroma, full in flavour and usually have sticky orange rinds. During maturation these cheeses are washed in brine and a multitude of wines or spirits. They are kept in a clean environment and the rinds can be eaten. Valençay, Crottins, Chabichou: Goats' milk cheeses tend to develop the most fabulous and colourful rinds. Since they are relatively young and generally kept in a clean environment the rinds can be eaten. Of course, whether to eat a rind or not is down to personal choice. Many of our customers remove all their rinds whilst others are convinced that the rinds can be the best part of a cheese. Assistant Cheesemonger at The Teddington Cheese. First and foremost s/he must have a general enthusiasm for food and a specific liking for cheese. Initially two days a week will be required, one of which will be Saturday. Applicants must be able to work extra time during the Christmas period. Please telephone Orlando on 020 8977 6868. Summer work in Normandy, France at La Maison du Vert. Two people to help run a small but busy vegetarian hotel restaurant during the summer. The work will involve serving and clearing away breakfasts, room cleaning, serving lunch and dinner, welcoming guests and helping in the gardens. We offer a 35/40 hour week, 25FFr per hour, own room, laundry service, use of van on day off, all meals and drinks included. We would like persons to have a current clean driving license and speak a little French, enjoy their own company as this is rural France and enjoy meeting folk. Job vacancy at La Maison du Vert has now been filled. Positions at The Teddington Cheese and The Kew Cheese occasionally arise. Please contact 020 8940 1944 for latest vacancies. In our last edition of the Teddington Cheese Wire we examined an article written 100 years ago on the threat of foreign imports to the future of British Cheese. In fact the threat came from within the UK itself with the lack of government effort after the second world war to reestablish farmhouse production of British Cheese. Only over the last twenty years has traditional British cheese-making started to recover. It is the intention of this article to forecast the potential and the threats to British cheese-making over the next 100 years. Cheese has been made throughout Europe for hundreds of years and many countries and regions have developed their own types of cheese. The geography, flora and fauna and the influence of man (e.g. the agricultural teaching of farmers by monks) have all dictated the type of cheese-making. I have often heard people saying that British cheese is the best in the world - indeed the British do make superb cheese but so do the French, Swiss etc. all with their own character. We will always have foreign cheese imports and so we should. Whilst I believe that the quality and sales of traditional British cheese will withstand foreign imports, the success of our own exports is limited. I took a trip around a dozen of the best cheesemongers in Paris and could only find old greying Stilton and block factory cheddar. Our fellow Europeans know little of real British cheese and I believe that from our present position we can only move forwards. Lack of organisation within the farmhouse cheese industry. In Britain we have the territorial cheeses, for example, Stilton, Cheddar, Lancashire, and Cheshire. Although Stilton is the only legally protected cheese I am sure they will all survive the next 100 years. However, the up and coming cheeses of today such as Wigmore, Golden Cross and Berkswell will disappear when the present producers cease trading. Possibly, one or two will survive through their sons and daughters but the vast majority will not. We need to learn from the success of the French and the Italians. They have AOC's and DOC's, regulations which dictate how, when and where a cheese can be made and stipulate that no other cheese may be called by the same name. Any number of farms can make a particular cheese provided that they satisfy all the rules governing the AOC or DOC requirements. In fact, in Italy especially, these groups of producers have pooled their resources to create a more powerful marketing cooperative to help promote their cheese in home and export markets, and have been very successful. In this way successful cheese-makers could perhaps encourage other individuals to start making the same cheese nearby. Of course this would be a courageous step since no-one wants to give away their secrets and loose market share. However, I believe that the long term benefits and the future of British cheese depends on this sharing. Threats from our own Government's legislation. If an individual decides to make cheese it is no longer a simple matter of buying a small farm and a herd a cattle. A milk quota first has to be purchased, which can cost almost as much as the land, and makes the venture unviable, even before a single cow has been milked. In this climate, very few new cheese-makers are likely to emerge. Cheese-makers are fearful of the Government's plans for a new food agency. It is envisaged that all food producers and retailers will be levied a charge and the amount will bear little resemblance to their ability to pay. In the same way that business rates have strangled small independent high street shops the small farm producers fear they will be asked to carry a heavy and crippling financial burden. In general I heartily support the work of the Environmental Health Officers and feel that some pressure put on cheese-makers can only help to keep hygiene and good working practices at the front of their minds, and ensure a healthy future for the industry. However, recently some Health Officers have been involved in controversial cases regarding the blanket destruction of cheese following reported food poisoning incidents. Each time they appear to have been illogical and have threatened the lively-hood of the cheese-maker. It is these actions by over zealous Environmental Health Officers that cheese-makers fear most. It amazes me how farmhouse cheese-makers summon up the energy to go out 365 days a year to milk and tend their animals and then slave for hours in their small dairies making cheese. On top of this they have to mature, pack, sell and dispatch their cheese. Cheese-makers tell me that the satisfaction of producing their own cheese and seeing it find its way to people who appreciate it makes up for all the hard work and the small financial rewards. I believe the major threat to real British cheese is, without doubt, that of the Health Department's quest for an antiseptic and cotton-wool coated world. I hope that the general public will soon recognize that life's richness can be threatened by having to boil your lettuce, buy straight bananas produced for easier packing and egg yolks dyed to 'shade 3 harvest yellow'. I believe that when people decide that we have gone far enough down the route of sterility then the Government will have to stop and listen. Of course, it may be too late for some cheese-makers, but I hope that the change will come in time for most. I believe the individuals in this small industry are strong enough to survive.